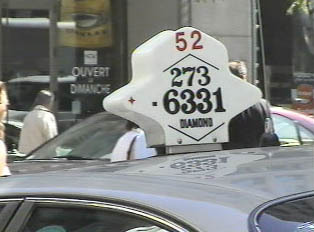 Taxis are plentiful in big cities and can easily be hailed or called. It is a common courtesy for a store clerk to call a cab for a customer – the telephone number of a company is always near the phone at the front register. One can always ask for a cab at any hotel front desk. There is no need to negotiate fares, since all taxis have meters, and fare information must be posted on the back window. In Montreal, there is a set fee for the ride from the city to the airport, regardless of how many passengers travel at once.